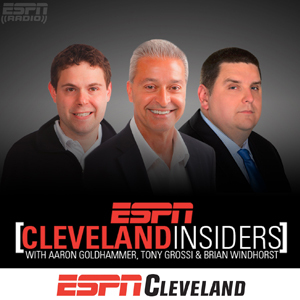 The Insiders featuring Aaron Goldhammer is the place to find "Hey Tony" with Tony Grossi and "Hey Windy" with Brian Windhorst. MLB.com's Anthony Castrovince joins The Insiders to talk about the Indians ALDS loss to the Astros and how much falls on Terry Francona. ESPN Cleveland Browns analyst Tony Grossi joins Emmett Golden on The Insiders to run through the Browns QB room and what he sees heading into training camp. Former MLB pitcher Jensen Lewis talks about a normal week for a starting pitcher and what drills, workouts and rest the guys go through. Tony Grossi runs through a few questions that will be facing the Browns as they head into training camp in August. ESPN NBA analyst Brian Windhorst explains how the Cavs are playing against the Warriors and how close they really are to competing. ESPN NBA analyst Brian Windhorst gives a potential game plan that the Cavs may employ in game 1 vs. the Warriors. MLB.com's Anthony Castrovince talks about the PED rumors with Jose Ramirez and a little bit on the MLB's testing policies. Tony Grossi joins Emmett Golden on The Insiders to give some of the biggest observations from the first Browns OTA practice. ESPN NBA analyst Brian Windhorst recaps the Cavs loss to the Celtics including the biggest issues and what can be fixed moving forward. ESPN NBA analyst Brian Windhorst runs through a few of the potential game plans for the Celtics to limit the Cavs, specifically Kevin Love. ESPN Cleveland Browns analyst Tony Grossi explains what goes into his mock drafts and what he expects this year with the Browns draft. ESPN Cleveland Browns analyst Tony Grossi talks about his latest mock draft which has Sam Darnold at 1 and if Tony thinks he will hold that spot. ESPN NBA analyst Brian Windhorst recaps the Cavalier's victory over the Pacers, including Kevin Love's injury and some positive things for the Cavs. ESPN Cleveland Browns analyst Tony Grossi goes through his top 5 Browns draft picks since the team returned in 1999 including a shocker at #5. ESPN Cleveland Browns analyst Tony Grossi joins Emmett Golden on The Insiders to talk about his latest mock draft and the Browns' picks. ESPN NBA analyst Brian Windhorst talks about how big the Tristan Thompson rumors are and if they will have any impact in the locker room. Jerod Cherry joins Emmett Golden on The Insiders to talk about the one QB in the upcoming draft that they don't want the Browns to go after. ESPN Cleveland Browns analyst Tony Grossi joins The Insiders to go through his latest mock draft and why he has the QB's going so early. Jason Gibbs joins Emmett Golden on The Insiders to talk about a Browns mock draft and the one thing Gibbs doesn't want the Browns to do. MLB.com's Anthony Castrovince gives his "Tribe 5," five interesting numbers from the Indians' start to the season, including Edwin Encarnacion's speed. Former Indians pitcher Jensen Lewis talks about his memories of Opening Day and what the players are going through on Day 1. Live from the NFL owners meetings, Tony Grossi talks about his sit-down with Browns owners Jimmy and Dee Haslam, including what the feeling was in the room. ESPN NBA analyst Brian Windhorst joins The Insiders for "Hey Windy" to talk about the Cavs seeding and who they may see in the first round. ESPN Cleveland Browns analyst Tony Grossi joins The Insiders to give an update from the NFL Owners Meetings in Orlando including the Odell Beckham rumors. ESPN Cleveland Browns analyst Tony Grossi talks about Josh Allen's pro day and if he has closed the gap on Sam Darnold at all. ESPN NBA analyst Brian Windhorst joins The Insiders to give his take on where he believes the Cavs are as a team and with their lineups. Jason Gibbs joins Emmett Golden for The Insiders. They talk about Sam Darnold's upcoming pro day, the Browns involvement and how much pro days matter. ESPN Cleveland Browns analyst Tony Grossi joins The Insiders to talk about the Browns' reported trade for Dolphins WR Jarvis Landry. ESPN's Brian Windhorst joins The Insiders to give his potential Cavs playoff rotation including starters and whose minutes will be cut. Jason Gibbs joins Emmett Golden on The Insiders to discuss what the Browns QB room may look like next season and how they see it shaking out. ESPN Cleveland Browns analyst Tony Grossi gives his recap of the NFL combine, specifically how some of the top QBs have performed. Its the Insiders with Emmett Golden, Jerod Cherry and Matt Fontana. They get into a spirited debate on who the Browns should take 1st overall, a QB or Saquon Barkley. Jason Gibbs, live from the NFL combine joins Emmett Golden to talk about some of the top players in Indianapolis and who they are watching. ESPN NBA analyst Brian Windhorst joins The Insiders to talk about the Cavs recent offensive struggles and what their source may be. ESPN Cleveland Browns analyst Tony Grossi joins Emmett Golden on The Insiders to talk about the Browns chances to get Saquon Barkley. ESPN NBA analyst Brian Windhorst explains why the Cavs are energized and ready for the 2nd half of the season, coming out of the All-Star break. Jerod Cherry joins Emmett Golden on The Insiders to react to Bill Polian's comments about Louisville QB Lamar Jackson's NFL future. ESPN Cleveland Browns analyst Tony Grossi explains why he has AJ McCarron as the #1 QB in his Browns QB tracker and why he fits in Cleveland. Emmett Golden and Jason Gibbs talk about the future of Browns WR Corey Coleman with the team after ESPN Cleveland Browns analyst Tony Grossi expects him to possibly be moved. It's "Hey Tony" on The Insiders with ESPN Cleveland Browns analyst Tony Grossi. He talks about AJ McCarron and if he would fit in Cleveland. ESPN Cleveland Browns analyst Tony Grossi joins Emmett Golden and Jerod Cherry on The Insiders to recap Todd Haley's first press conference. Jason Gibbs joins Emmett Golden for The Insiders to talk about Tony Grossi's QB tracker which has AJ McCarron as the #1 likely QB to come to Cleveland. ESPN Cleveland Browns analyst Tony Grossi joins The Insiders for "Hey Tony." He takes a look a few upcoming NFL free agents and if the Browns would be interested. ESPN Cleveland Browns analyst Tony Grossi joins The Insiders to talk about Jimmy Garoppolo's monster contract and how that affects Kirk Cousins and the Browns. ESPN NBA analyst Brian Windhorst looks back on the busy NBA trade deadline for the Cavs including why he thinks the Cavs made so many moves and if it helps keep LeBron. Jerod Cherry joins Emmett Golden on The Insiders to run through a 3-round mock draft for the Browns with a few interesting twists. 3-time Super Bowl champion, Jerod Cherry joins The Insiders to talk about what its like to win the Super Bowl and what exactly happens right after the game. ESPN NBA analyst Brian Windhorst joins The Insiders to talk about the latest article on LeBron James and his take on the story. Three-time Super Bowl champion Jerod Cherry talks about the week leading up to the Super Bowl and what prep looks like for a player. ESPN Cleveland Browns analyst Tony Grossi explains what he would like to see the Browns do with quarterback DeShone Kizer and if he can still help the team. ESPN NBA analyst Brian Windhorst joins The Insiders on to talk about some of the latest news on the Cavs including some trade rumors. ESPN Cleveland Browns analyst Tony Grossi joins The Insiders to talk about the Browns being close to hiring Todd Haley as offensive coordinator and what he brings to the team. Emmett Golden looks ahead to the AFC/NFC championships and talks to Tony Grossi about the lack of highly drafted QBs playing and compares it to the Browns. ESPN Cleveland Browns analyst Tony Grossi talks about the Jacksonville Jaguars turning their team around quickly and how the Browns can follow their path to the playoffs. Emmett Golden and Jerod Cherry host The Insiders, where they talk about the Browns hiring of Eliot Wolf and Jerod talks about what an assistant GM does. The Insiders with Emmett Golden and Jason Gibbs talk about some QB options for the Browns this offseason that don't involve Alex Smith or Kirk Cousins. ESPN Cleveland Browns analyst Tony Grossi joins The Insiders to talk about Kirk Cousins, Alex Smith and the Browns offseason QB plans. ESPN Cleveland Browns analyst Tony Grossi reveals his No. 1 player for the Browns in the 2017 season and explains why he picked that player. The Insiders with Jerod Cherry and Emmett Golden talk about the possibility of the Browns trading back from their fourth pick. Emmett hates that idea and gives reason why. ESPN NBA analyst Brian Windhorst joins The Insiders to preview the Cavs-Celtics game, LeBron James vs. Kyrie and some other story lines. ESPN Cleveland Browns analyst Tony Grossi talks about the Browns wide receiver position and he makes a bold statement about Corey Coleman. Jerod Cherry and Aaron Goldhammer hear from Browns HC Hue Jackson talking negatively about QB DeShone Kizer and what that means for Kizer's future. Emmett Golden and Aaron Goldahmmer discuss on The Insiders, one of the players on the Cavs that has been huge for the teams success after some thought his prime was over. ESPN Cleveland Browns analyst Tony Grossi runs through the latest rumors surrounding Browns coach Hue Jackson including the Cincinnati Bengals. ESPN Cleveland Browns analyst Tony Grossi gives his reaction to Browns GM John Dorsey "calling out" his roster and what it tells him about Dorsey. ESPN NBA analyst Brian Windhorst joins The Insiders to talk about some of the options that LeBron James will have this summer when it comes to his contracts. MLB.com's Anthony Castrovince joins The Insiders with Aaron Goldhammer to talk about the potential future for Jason Kipnis and one option Anthony sees for him. ESPN NBA analyst Brian Windhorst talks about the latest news on Derrick Rose including what options he has for his bone spur in his ankle. ESPN Cleveland Browns analyst Tony Grossi talks about where the Browns can go from the firing of Sashi Brown and what he thinks may be the next move. Emmett Golden joins Aaron Goldhammer for The Insiders to talk about LeBron James' resume to win the NBA MVP this year and why he isn't getting more love for it. Jerod Cherry joins Aaron Goldhammer on The Insiders to explain why he would take Oklahaoma QB Baker Mayfield on the Browns. ESPN Cleveland Browns analyst Tony Grossi weighs in on the report that Hue Jackson wanted Carson Wentz over Jared Goff in the 2016 draft. Good Karma Brands CEO Craig Karmazin takes a question from an ESPN Cleveland fan about the signal strength of the station and exactly what goes into it. GKB CEO Craig Karmazin talks about why the company decided to launch "The Land on Demand" and his thoughts on how everything is going so far. Good Karma Brands CEO Craig Karmazin hosts The Insiders to answer any and all fan questions. One is why Craig decided to launch a station in Cleveland. ESPN Cleveland Browns analyst Tony Grossi talks about Jabrill Peppers hit in the Bengals game, which resulted in a penalty and how Hue Jackson can help. ESPN Cleveland Browns analyst Tony Grossi joins The Insiders with Aaron Goldhammer to talk about the latest rumors about Josh Gordon being out on the town. ESPN's Brian Windhorst joins The Insiders with Aaron Goldhammer to talk about the Cavaliers' bench and give a shocking stat about LeBron James this season. The Insiders with Aaron Goldhammer and Emmett Golden talk about the job Ty Lue has done with the Cavs and if his job should be in question. ESPN Cleveland Browns analyst Tony Grossi joins The Insiders to talk about the Browns poor play call in the 2nd quarter and how its Hue Jackson's fault. Jerod Cherry, Matt Fontana and Aaron Goldhammer go through a round of "Fact or Fiction" on The Insiders, focusing on the Cavs. The Insiders with Emmett Golden and Aaron Goldhammer talk about the expectations placed on Josh Gordon for the rest of the year and the state of the Browns wide outs. The Insiders with Aaron Goldhammer and Emmett Golden talk about how much of the bad fortune of the Browns recently fall on the owner's feet. ESPN Cleveland Browns analyst Tony Grossi joins The Insiders to give his take on the Browns messing up the trade for AJ McCarron. ESPN's Brian Windhorst talks about the Cavs' lack of defense and how bad it really is. The Insiders with Emmett Golden and Aaron Goldhammer talk about Myles Garrett's rookie season, the injuries and where they are at with him. MLB.com's Anthony Castrovince talks about some of the upcoming decisions the Indians will face this offseason and who may be back. ESPN Cleveland Browns analyst Tony Grossi gives at least one positive thing about the Browns during a time when its been all bad. ESPN's Brian Windhorst explains on The Insiders a comment from LeBron about his injured ankle and what Brian took away from it. The Insiders with Aaron Goldhammer and Emmett Golden discuss how Cavs fans should feel after the Gordon Hayward injury. ESPN Cleveland Browns analyst Tony Grossi gives the chances that Peyton Manning would come to the Browns front office to turn the team around. ESPN NBA analyst Brian Windhorst joins The Insiders for "Hey Windy." Brian gives the latest on LeBron's injured ankle including how severe it is. Former Indians pitcher and current Fox analyst, Jensen Lewis explains on The Insiders why he feels the Indians should win game 5 of the ALDS. Former Indians pitcher Jensen Lewis joins Aaron Goldahammer on The Insiders to talk about the Indians ALDS roster and what Jensen expects from each player. ESPN Cleveland Browns analyst Tony Grossi reveals the worst Browns game he has ever covered and where Sunday's loss ranks. MLB.com's Anthony Castrovince gives us his "Tribe 5," five important numbers from the past week of Indians baseball. MLB.com's Anthony Castrovince goes through the Indians entire roster and predicts who will make the 25-man playoff roster for the ALDS. ESPN Cleveland Browns analyst Tony Grossi and Aaron Goldhammer play a little "Fact or Fiction" about the Browns defense and wide outs. The Insiders with Emmett Golden and Aaron Goldhammer talk about Hue Jackson claiming he doesn't need to prove to owner Jimmy Haslam there's hope. Emmett Golden and Aaron Goldhammer talk about the potential return of Josh Gordon to the Browns and if they would welcome him back. Emmett Golden and Aaron Goldahmmer discuss the latest news on Myles Garrett's ankle injury and how it might impact the team moving forward. ESPN Cleveland Browns analyst Tony Grossi gives the number of games the Browns need at minimum to see what they have in DeShone Kizer. ESPN Cleveland Browns analyst Tony Grossi explains on "Hey Tony" why he feels DeShone Kizer is ready to take on the starting role for the Browns. Emmett Golden joins Aaron Goldhammer for The Insiders to talk about some of their favorite Kyrie Irving memories and if they are tainted with him leaving. MLB.com's Anthony Castrovince joins The Insiders to give the latest on the Indians injuries to Andrew Miller and Danny Salazar. ESPN Cleveland Browns analyst Tony Grossi gives his game preview for the Browns/Giants, Monday Night Football matchup including what Myles Garrett can do. MLB.com's Anthony Castrovince talks about Corey Kluber and some important stats of his last few starts. He also talks about where Kluber may end up after his career. The Insiders with Aaron Goldhammer and Emmett Golden give their thoughts on Hue Jackson's updated QB depth chart for the Giants game. The Insiders with Jerod Cherry and Aaron Goldhammer look back on the day of practice with the Browns and why the offense looked better today. ESPN Cleveland Browns analyst Tony Grossi provides an update on the Browns QB depth chart and what we may see in game 3 vs. the Giants. MLB.com's Anthony Castrovince gives an update on Indians outfielder Michael Brantley while also talking about the last week of baseball with the Tribe. Emmett Golden joins Aaron Goldahmmer for The Insiders at Browns training camp. They talk about what they have seen from Myles Garrett thus far in camp. ESPN Cleveland Browns analyst Tony Grossi explains on Hey Tony why the Browns may have gone with Brock Osweiler over Cody Kessler and it has to do with 20 yards. The Insiders talk about the Indians roster move of Andrew Miller to the disabled list and the latest news on Josh Tomlin. MLB.com's Anthony Castrovince joins The Insiders to give his thoughts on the Indians trade deadline and some moves they did and didn't make. ESPN Cleveland Browns analyst Tony Grossi recaps the day at Browns camp including some news on Myles Garrett and Jabrill Peppers. ESPN Cleveland Browns analyst Tony Grossi joins Emmett and Jerod on The Insiders to recap Day 1 of Browns training camp and give a few updates. Jerod Cherry joins Dave Skoczen for The Insiders. They talk about some of the highlights of the Cavaliers' news conference. Anthony Castrovince runs through the latest Indians roster moves and what trades may still be on the radar for the Tribe. ESPN Cleveland Browns analyst Tony Grossi plays a little "Fill in the Blank" on The Insiders with Dave Skoczen. Some questions include Myles Garrett and training camp. MLB.com's Anthony Castrovince jumps into the mailbag on The Insiders to talk about Bradley Zimmer and Mike Clevinger. Emmett Golden joins The Insiders to talk about Kyrie Irving's comments about the state of the Cavs. Emmett didn't have a problem with what Kyrie said. Jerod Cherry joins The Insiders to explain why Brock Osweiler may have a bigger impact on the Browns than some think. ESPN Cleveland Browns analyst Tony Grossi plays a little "Fact or Fiction" on The Insiders and is asked if the Browns quarterback room is better than 2016. ESPN NBA analyst Brian Windhorst gives a quick scouting report of Cedi Osman and what he will be bringing to the Cavs this season. Aaron Goldhammer and Emmett Golden debate if the Cavs have gotten better this offseason with some of their additions. MLB.com's Anthony Castrovince gives his "Tribe 5", the most important numbers for the Indians heading into the All-Star break. Its our "Insider to Insider" question on The Insiders. Jerod Cherry is asked, who is the most Gregg Williams-like coach you ever played for? Jerod gives his answer. On The Insiders, Jerod Cherry gives some insight on what a toll professional coaching/managing has on some coaches and what sacrifices they may have to make. ESPN NBA analyst Brian Windhorst gives a few reasons why Chauncey Billups was not given a fair offer from the Cavs. MLB.com's Anthony Castrovince talks about the Indians lineup and what is going on with Francisco Lindor. ESPN Cleveland Browns analyst Tony Grossi previews rookies Jabrill Peppers and David Njoku. ESPN Cleveland Browns producer Jason Gibbs joins Dave Skoczen to preview the Browns' upcoming London trip and some of the behind-the-scenes logistics. Following President Trump inviting Dan Gilbert into a picture with the Cubs, The Insiders wonder what he should have said back. ESPN NBA analyst Brian Windhorst explains why its foolish to worry about LeBron James' future right now, since its undetermined by everyone. Emmett Golden and Aaron Goldhammer talk about the duties the new Cavs GM will have to face and which one they should do first.